I saw in a previous post another Australian was talking about Protestantism and the Reformed Church of France. Although, as you said, French are either generally ambivalent or hostile towards religion, how do they feel about the historic treatment of the Huguenots and events such as the Saint Bartholomew�s Day Massacre? Are there feelings of guilt or remorse amongst the population, apathy towards these events, or just a feeling that it was entirely the fault of the Monarchy and Catholics, one of which has now been eliminated and the other effectively neutered by the Separation of Church and State? Are people generally interested in the Huguenots as a movement or is there such a strong aversion to the damage caused by the Wars of Religion that the whole period is distasteful to most people? I imagine the whole thing must be somewhat ambivalent because, despite the enormous damage and suffering caused by the Wars of Religion, Henri of Navarre (Henri IV) emerged from it and, as I understand it, is regarded as a great king. 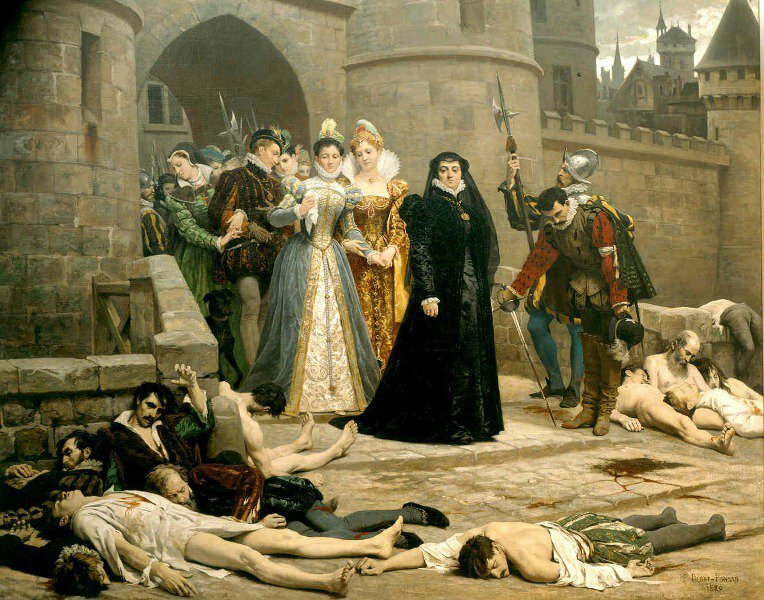 I�m not sure how and what you learned about the 16th century Wars of Religion in France (as this is what we�re talking about here for those of you who had no idea) but we cannot reduce it to an oppression and a massacre of the Protestants by the Catholics. We�re not in a situation here that would be similar to genocide or something along those lines, with defenseless Protestants against blood-thirsty, armed and violent Catholics. We�re talking about a war that lasted a few decades (about 40 years if I�m correct). The Catholics came out as the victors, but it could as well have been the Protestants. Yes, the Catholics were armed, violent and bloodthirsty, but so were the Protestants. The Saint Bartholomew�s Day Massacre�(I advise you to read the French page in Wikipedia if you can, it’s better, the English page considers as fact things are just hypotheses at times) is one of the most famous events of this war, but while it took place in a quite unique context (while King Charles IX and his mother Catherine de Medici trying to end the war, just after they married Henri de Navarre and Marguerite de Valois, etc. ), in Paris, and involved a lot of �important� people, it is just one of the many massacres that happened during that time. There have been similar massacres in Protestant strongholds, but maybe they�re not as famous because they didn�t take place in Paris, nor in a �famous� context. And let�s not forget that in Protestant areas, many Catholics were as oppressed and massacred as Protestants were in Catholics area. But all in all, nowadays, it is understood that this civil war was as political as it was religious, if not more, and I think that in France it is regarded as just one of the many episodes of French history. It�s not seen as special or anything, and I don�t know anybody that has strong feelings, one way or the other, about it. Maybe it has been �toned down� over the years in the educational system, mostly because it is the main civil war we have had in France and well, when kids learn history, it�s always a very �patriotic� version of it with France being portrayed as the good guy in every situation (just like it is the case in any other country), so in this context, hard to spend too much time on an episode where French people were at war against other French people. I think what I find interesting in your question (and it is the reason why I�m having trouble answering it) is that you insist of French people�s �feelings� in it. Personally I find it odd that anybody would have any feelings about events that took place more than 400 years ago. It is just one of the many episodes of French history, no more no less. Also I don�t think French people nowadays have any feelings, good or bad towards Protestants back then. They�re just seen as one faction in the war, that�s pretty much it. Massacred at times, and murderers at other times. Previous Post Can you please tell us a little more of French attitudes towards Robespierre? Next Post What was popular on Ask a Frenchman in 2011? Hopefully, my question will make a lot more sense in light of the above articles! I was thinking of the oppression of the Huguenots in the same light as white/British Australian revisionist guilt over the oppression of Aboriginal tribal cultures. Yes, I understand that the Huguenots committed atrocities, just as the Catholics did. As is true of all history, nothing is black and white and terrible deeds were done by both sides. Your statement that “Personally I find it odd that anybody would have any feelings about events that took place more than 400 years ago” is the most telling for me, coming from a nation that is now starting to grapple with events that happened primarily in the 19th Century. Although ultimately, an apology statement was issued by Prime Minister Rudd to Aborigines in 2007, parts of the community question whether modern Australians really should apologies for deeds committed by their forebears. Maybe part of this is due to the fact we are a younger nation. Anyway, although crimes were committed by both sides, ultimately the Huguenots were largely expelled from France, leaving the Roman Catholic Church with a monopoly on religion until the Revolution. That alone would have had a significant impact on French history. Likewise, the loss of many tradespeople, particularly the silkweavers, would have had a severe economic impact on your nation. However, I have also heard that Henri of Navarre is regarded by some (many?) French people to have been your greatest king so I guess I was also subconsciously wandering if there was some wish that history had taken another path. We are really in the speculative realm when it comes to alternative history but, had the protestant dynasty continued, the Bourbons would never have come to power and all of French history may have been different. That is enough day dreaming though! To end this long post, I must ask about French attitudes towards Calvin. Obviously, he is now closely associated with Geneva but he was born in France. As a Catholic/post-Catholic country, are people interested in his teachings, proud he came from France or is he thought of as an heretic or is there simply apathy about the guy? Yeah, thinking about it a bit further, people from the “new countries” tend to have a very different approach to history than the “old countries.” From a historical perspective I tend to divide the world in three parts: the “new countries” being countries that have been colonized in the past 500 years or so, and where the colonizer became the majority of the population (basically the American continent, Australia and New Zealand – I may forget one or two), the “old countries” being basically Europe and most of Asia that have a history dating back to thousands years ago, and finally the “colonized countries” (roughly Africa, the Middle East and a few more) that have been colonized but gained independence in the 20th Century, and the colonizing population is gone if not its influence. And yeah, those three groups of countries tend to have very different approaches to history. One day I read a line that is so obvious when you think of it, but the thing is that we don’t always think of it. That line was in an American book about French culture and it basically said: “The difference between French people in France and Americans in the US, is that French people are both the dominant population and the natives of the land”. So back to our topic, there cannot be “feelings” involved for an event that took place so long ago, and that was involving French vs French and that was mostly political in nature (religious too, but they went hand in hand back then), not racial or cultural. Yes, I feel that there is a need to apologize from Australians to the Aborigines, same goes in the US with Amerindians, and same goes with the French and Africa (but in this case it’s too recent so too many feelings are involved). But there is no reason whatsoever for the French to apologize to the Huguenots. And that for many reasons, the main one is that France is not officially Catholic today (and even in practice, French people who are fervent Catholic still don’t really like Protestants for the most part). Also, notice that while the term “Huguenot” does exist in France, it is rarely used – and I never use it in a French context. I think it comes from the fact that in the Anglo world, when you use the term “Huguenot” it’s more a question of cultural/racial origin (French) than a question of religion (as both the “Huguenots” and most Anglos are Protestants). In other terms, a Huguenot is a French that is a Protestant. So in France, it doesn’t matter that they’re French. Not sure if I make sense here. Concerning the patriotic dimension of history, don’t get me wrong, here I mean basic history that is being taught in school to every citizen. Not “grown up history” that historians deal with. And I assume that this is roughly the same in any country, isn’t it? Or maybe countries that aren’t/weren’t as important on the international scale don’t have that need as much? -Protestants were never “expelled” they left in mass (but not all of them), but they didn’t do it because of the Wars of Religion, they did it almost a Century later when Louis XIV became a bigot and revoked the Edict of Nantes (that allowed religious freedom in France), making Catholicism the only authorized religion in France again. And while it must have had an economical impact, it’s all relative (I don’t have facts here, I may say things that are wrong). Also keep in mind, that revocation of the Edict made the most religious Protestants flee, but the ones who were not that religious simply converted to Catholicism and went on with their lives. -Maybe I read you wrong, but you seem to imply that the Catholic Church had the monopoly in France from this revocation to the Revolution only. Not at all. The Catholic Church had the monopoly from 497AD to the Revolution with decades here and there were other religions were more or less tolerated, one of them being the 1598-1685 period of the Edict de Nantes. -When Henri III died, he had no heir, and tracing back the genealogical tree, the next in line was Henri de Navarre, a distant cousin of the Valois (the Valois being the reigning dynasty), there was a major problem though. Henri was a protestant and as such couldn’t become King. -There was two options: either he stays Protestant, can’t become King and another distant cousin somewhere becomes the King (I don’t know who, but he must be somewhere in history books), or he converted to Catholicism and became King. This is what he did. And as such he is the first King of the Bourbon branch (Louis XIII is his son, Louis XIV his grandson). So you see, there is no Protestant dynasty, there couldn’t be one. Or if there was one, it is the Bourbon (don’t tell that to Louis XIV, but once again, religion is not a race, nor a culture). Finally, to answer your final question here is what I know about Calvin: he was born in Switzerland, he was one of the inventors of Protestantism, and some people today are called Calvinists, I don’t even know where they live… in Switzerland maybe? France? To deal with the last issue first, Calvin (born Cauvin) was French! He was born in Noyon, Picardy and lived there until he went into exile in Switzerland in his mid-20s. Later on, he spent a lot of time in Strasbourg which, in hindsight, he considered one of the most important periods in terms of the development of his beliefs. Yes, it is interesting to read of the different approaches to history. I also think it is because Australia is a very young nation that it leads to us being very self-conscious and hence, self-scrutinising. As I said before, even at a high school level, we were fortunate enough to be shown different approaches to history and to take a critical look at our own mistakes, (notably Vietnam.) I was fortunate enough to have an exceptionally good teacher, though. We looked at the Cold War in general from both American/Australian and Soviet perspectives. Also, in a different class, led by a different teacher, we were able to look critically at Australia’s relationship with our South-East Asian neighbours, including the many diplomatic and cultural mistakes that have been made, racist attitudes of the past, White Australian policy, fear of the “Yellow Peril” and so on. Not to argue with you, but the same argument could be (and has been) made about the attacks on Aborigines: any atrocities that occurred happened in what were, at that time, a group of separate British colonies, long before the establishment of a federated, self-governing Australia. Ok, I’m getting back at publishing comments (worry not Larry, none of them were lost). Concerning the “patriotism in school history” yes, maybe it’s an Australian thing, maybe it’s because your country is too young. Maybe it is because it never had any “hereditary enemy”. You could if both Aborigenes and British colons were natives, if both had roughly the same political power, if both had stood a chance to defeat the other one, if both were basically the same people (in ethnicity, culture, history, genes, you name it) except that one faction had decided to have a different way of life than the other one a few decades before. That being said, this whole saying sorry for crimes made by your ancestor is Anglo-political-correctness (triggered by protestant chronic-guilty feeling?) BS. If you want to make things right, stop oppressing the oppressed, saying sorry because your ancestors have started the oppression doesn’t absolve people for perpetuating it. Thanks, Frenchman. Glad no data was lost when you were having technical problems. I’ll just comment on your last paragraph: yes, it is probably Anglo-political correctness but I don’t think that stems from Protestantism. It is a more modern phenomenon, probably related to the rising social consciousness in the 1960s and maybe even thinkers like Michel Foucault for raising awareness of the oppressed and marginalised. We probably take it to an extreme, though, as do the Americans and English. Currently, though, when Aborigines are successful in European society they are ostracised from their own communities for selling out to the “white man’s world.” I don’t really know how their communities can thrive without becoming part of the mainstream culture though to some extent. Is it viable for nomadic stone age tribes to function autonomously in a modern first-world country? Can they modernise their culture but remain distinct from European values? I don’t know but these are the kind of questions they will need to ask themselves. I came across your blog and thought that this conversation was interesting because I am also a student of French religious history. As a French protestant, I might have a different approach to the topic. The whole post started with the question of feelings, and you did not seem to understand why the people who have been persecuted during centuries could carry the weight of a distant past. Thanks to contemporary ecumenism (post-Vatican II), relationships between Protestants and Catholics around the world in general and in France in particular have reached new levels of reciprocal respect and collaboration. I think we can all be happy about that. –	The persecution of Protestantism in France was a process that began even before the wars of religion (Calvin for example left Paris for Strasbourg in 1536 to flee persecution). –	There were continuous struggles after the first wars of religion to which you refer in your post: for example, the second wars of religion (1621-1628) where 80% of the population of La Rochelle, a Protestant city, died during the siege of the city; Even during the so-called tolerant period under the Edict of Nantes, the King had special troops called �Dragons� who were sent expressly to Protestant villages to convert them by force (especially after the 1660s); the progressive destruction of the Protestant churches and seminaries; and finally, the Revocation of the Edict of Nantes that banned Protestantism all together. It is also worth mentioning that while many did flee to Switzerland, the UK, the Netherlands or Germany, etc, taking with them their skills such as banking (see modern Switzerland as an example), there were many families that stayed and endured the persecutions and new wars (War of the Camisards) without leaving their Protestant practices; even in 1815 during the reestablishment of the Monarchy, there was something called the �terreur blanche� in which many Protestants were killed in the Gard Department. Etc. Etc. Etc. –	The fact that just this year President Sarkozy went to the �Mus�e du D�sert� (the symbol of the Protestant resistence) in order to both pay homage to the Protestants who were killed unjustly during these conflicts and acknowledge that the freedom of conscience that we hold so highly in France today is largely due to the influence of Protestant ideas. I think that this indicates that there is, in fact, a sense of responsibility for the persecutions, even if most French remain apathetic on the matter. –	One word on the St. Barth�l�my massacre: it is not just �one of the many massacres that happen during that time.� It was a deliberate decision to physically eliminate the Protestant aristocracy (i.e., the leaders). Not only did it succeed on that matter, but it provoked a huge wave of persecution across the country. Historians estimate that the number of those killed in the following weeks are somewhere between 5,000 and 50,000�sounds a bit like genocide to me, non? –	If you do not know much about Protestantism today, it is almost entirely due to the fact that Protestantism was whipped out by the aforementioned conflicts in the 16th, 17th and 18th centuries. Some examples of Calvin�s influence in French-speaking Europe are Rabaut Saint-Etienne (one of the authors of the �D�claration universelle des droits de l�homme�), Henry Dunant (creator of the Red Cross), Madame de Sta�l, Benjamin Constant, Count de Gasparin (famous Swiss philanthropist and prolific writer), Paul Ricoeur, not to mention contemporary politicians such as Lionel Jospin, Michel Rocard, etc. Let me finish with a few words on the �invention� of Protestantism. Calvin clearly shaped Protestantism but cannot be considered as the founder of the movement which originates in Martin Luther�s and Ulrich Zwingli�s ministries in the late 1510s. Hope that these remarks have added to the conversation. As I said before, I really enjoy your blog and look forward to following! Thank you for your detailed response to my original question. Can I ask you a few more things? It is a positive development. Has the Taize Community played a significant role in this as well? Does the French Reformed Church have close ties to Taize? One thing that has been discussed in past discussions about religion on this site that we Anglos find hard to comprehend is that, due to the secularisation of France in 1905, religion is considered a private matter only. In some ways, this seems a very positive development given how the name of God is invoked by US Presidents and religious fanatics as excuses for wars and all kinds of abuses but what about the positive aspects of social activism? Does the French Reformed Church ever speak out publicly against war, human rights abuses and social problems? For instance, for all of the “Christian” warmongers in the USA, there are protestant peace/pacifist movements elsewhere in the world. Also, as examples that immediately comes to mind in Australia at the moment, church groups are speaking out against the ill-treatment of refugees and also gambling addictions. Do the French churches not work visibly in the public arena on these issues at all? Is it purely about private worship on Sunday in the chapel or home without speaking out on any issues? I would appreciate more info on this. I am French, and I would agree with Frenchman that generally there is apathy for Calvin. As well as there is apathy for the Huguenots… I think that French are rather distant with religion. Probably more than the Anglos. By the way, haven’t we one of the highest rate of atheist and agnostic people? Much fun and interest. My Scottish ancestors of many hundreds of years ago remained Catholic until they were mostly wiped out and their land stolen for refusing the new Protestantism of the crown. So were they expelled? Let’s just say they jumped to Ireland for a few years and then on to America, where funnily enough they became staunch Presbyterians (i.e., Calvinists)!! In response to one of your posts, John Calvin was in fact, French (Jean Cauvin) and a lawyer by training. He fled to Switzerland as a young man due to the persecution of Protestants in France at the time. He did not “invent” Protestantism, but was born Catholic and wrote about his conversion to Protestantism while in his 20’s. Within a year or two of converting he was forced to flee France and settled in Switzerland. From there he wrote extensively and his work became the primary source for the Christian denomination that would become known as the Reformed Church, of which the Reformed Church of France is one branch. Today about 75 million people worldwide consider themselves to be Calvinists, making him one of the most influential and far reaching theologians/philosophers to ever come from France. The Church of Scotland is Calvinist, and in America it is known as the Presbyterian Church and is the 3rd largest Protestant denomination in the US. How could I be proud of Calvin as a french man ? This person is a murderer ! I don’t blame calvinists, most of them are betrayed by the teaching of their churches who try to give a false history about him : Calvin, the poor man of great intelligence who has been forced to flee his country due to catholic madness… Forgetting completely that after this escape, he built a dictatorship in Geneva, the Theocratic Republic of Geneva, in which inhabitants were ceaselessly watched ; if they didn’t follow the new religion, they were banned of the city, or hung, decapitated and burnt at the stake. Lol this question is interesting. I’m currently living in the “Pays Huguenots” (Huguenots’ country) in France. I guess you’re an history enthusiast so let’s talk about a small town in the South of France you may know for its castle: Uz�s. Until the mid 70s, that’s what I’ve been told, protestants and and catholics were living separately. If you were catholic then you went to Doctor X, also catholic, and then if you were protestant to Doctor Y, the protestant one. But nowadays there is no such thing, Calvinists are smaller and smaller, they have lost the big part of their influence in this region or in France in general but they continue to play an important role in local politics (mayor, congressman). But around Uz�s it was the Calvinists who have begun the hostilities back in the 16th century, not the catholics. Do you think the union with the French Lutherans will help them stop this decline? Secularism (laicite) does not mean that the churches -and indeed the believers- are expected to refrain from expressing their faith or opinions in public or from trying to influence the issues relevant to modern society from a religious viewpoint (they do so all the time). It does not promote nor has it led to a particularly more secularised society – the French are not less religious than say the British or the Germans where the churches are institutionalised. Laicite solely refers to the fact that the church -any church- must be kept separate from all government and state-own institutions including public education. Since there is no official religion, the state cannot promote, support or fund any religious institution or activity and in that sense religion is regarded as a private matter, not one for the state, which is only concerned with guaranteeing religious freedom. Hope that makes sense. The problem didn’t start with them being Protestant in the 1500’s, it started 500 to 800 years before that, and possibly even dates back to before the Roman times. The problem started against the people of the Occitan Region. (Northern Spain & Southern France). Exact reasons will probably never be quantified, but the lingua d’Oc (language of the Oc) was considered “aristocratic” and they had wealthy & “noble” families. In 711-732 the entire area (Southern half of France) was overrun by the Moors (Muslim Conquest). You can be assured, the seeds of hatred ran deep, and when the Protestant movement started, the Occitanians were probably happy to reject Catholicism. The period from 1530 to 1598 was not just a religious war, it was a civil war, and the Huguenots were being backed by outside help from Britain and others. The Edict of Nantes in 1598 brought an end to that violence, but in 1685, the Edict was repudiated, and the Huguenots left en masse. My mothers side of the family are “Joubert”, and they escaped via Switzerland to Holland, and in 1688 sailed to Cape Town, in what is now South Africa, where they prospered in grape farming/wine making. Our side of the family lived on farms named “Languedoc” named after both the province but also the language they spoke. They remained a pure French bloodline until a marriage in 1839. In “South Africa”, a Dutch Colony, the French Huguenots became homogenised with the Dutch and other settlers, and ended up speaking a Dutch derivative now called Afrikaans, and they were followers of the Dutch Reformed Church. In 1805, the British “conquered” the Cape, to ensure Napoleon didn’t, and the British tried to force English language and religion on the inhabitants. This led to the diaspora into Africa called “The Great Trek”, where neighboring “Afrikaans” Boer republics were setup. The discovery of diamonds and gold in these republics , led to two “Boer wars”, the 2nd of which (1899-1902) was was the bloodiest with Lord Kitchener employing a scorched earth policy and concentration camps, where thousands of women and children were exterminated to force the Boer guerrillas to lay down their weapons. It was an expensive war and unpopular war, and it initiated the beginning of the end of the British Empire. In 1910, a semi-autonomous Union of South Africa was created from the 4 republics. In 1921 Afrikaans became an officially recognised language in the world. In 1961 the Union became the Republic of South Africa. So the problem definitely started with protestantism, the other events you mentioned are unrelated (and misunderstood for a few of them). First, you seem to assume that protestantism was located only in the South of France. It was not. While there were a lot of strongholds in the South West (because of the influence of Navarre? ), there were protestants everywhere in the country. First the Occitan region is a very vague and undefined thing. Linguistically, it’s basically the southern half of France, but this region is very diverse culturally and was even more so politically over the centuries. It never was one unit. Also, the parts of northern Spain that were part of “Occitanie” are very minor and non-consequential (the border between France and Spain happens to be a natural one – the Pyr�n�es mountains – which has made both countries and cultures quite different for a long time – as opposed to more artificial borders elsewhere). Sure there are “transnational” cultural units between both countries (mostly on both coasts, this is not a coincidence, this were the mountains are low enough to allow easy passage): aforementioned Navarre, the Basque country (not part of Occitanie – although it was part of Navarre at some point), and Catalonia (part of Occitanie, although a bit apart). Concerning the Muslim (Moor and Saracen) invasion, a few things. It didn’t affect the southern half of France, but only the South West (roughly Aquitaine, which was more or less independent at the time). Also, the Umayyad Caliphate never colonized the area, just tried to and failed (their 20 year presence was basically a long war), so as opposed to Spain, there is no influence of the caliphate in the culture or language and such in the region (although there is an influence on the topography, with towns such as Castelsarrasin – literally Saracen Castle – which was likely founded by the Saracens as a military stronghold). The biggest mistake you make here is seeing the development of Catharism as a consequence of the (religious?) vacuum left by the Muslims being defeated. It is not. All of that to tell you that there were no “seeds of hatred” in the sense you mean. Those various events affected various areas at various times, and more importantly you cannot see those people and area as unified. The very concept of country was very different as it is today. We’re talking about feudalism here, where the King controlled only a relatively small territory and drew his power from what duke, earl, marquee and such would follow him or not. is this the reason why not so many young people in france go to church? No. That’s because we’re lucky enough to live in a post-religious country/continent. Well, from the perspective of an European, it is strange that there are still churches in the 21st century. But maybe that’s because we know better how screwed up Rome is. I was being ironic for the Rome comment. …Never thought of studying other faith? Are you talking about me or Europeans in general? As I told you, post-religion is the way to go. I just can’t comprehend that they still exist in the 21st Century. Ok, it’s rhetorical, I do comprehend, when you brainwash entire populations over many centuries into believing things without questioning them, without thinking, it doesn’t go away that easily. In my church, we were thought that the Doctrine of Trinity is a dogma approved by the Council of Nicaea. But before that, there was really no doctrine like that. Some religion (group) occurred or was deliberately established to contradict existing religion (or faith). Religion is an evolutionary process and like the evolution theory, the resultant is always something better. your recognition of right and wrong, or in short, of your ethics? I do not understand much the concept of post-religion. See, that’s exactly one of my main issues with religions. Seriously, do you need religion to know what’s right and wrong? Honestly? Post-religion means a society that grows beyond that. That is being able to think by itself without a class of people telling them what to do or not do solely based on Superstitions, Century year old fiction and whatnot.